Selle eelvaate suurus: 800 × 539 pikslit. Teised eraldusvõimed: 320 × 216 pikslit | 640 × 431 pikslit | 1024 × 690 pikslit | 1500 × 1011 pikslit. 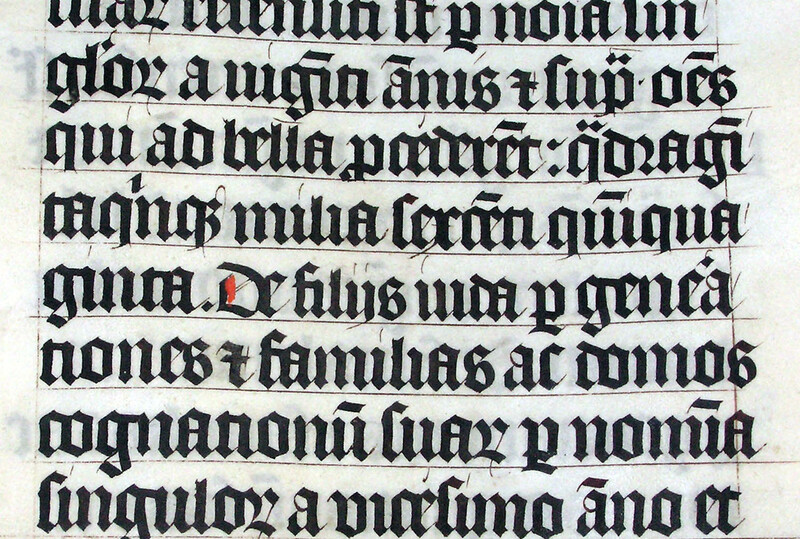 English: Calligraphy in a Latin Bible of AD 1407 on display in Malmesbury Abbey, Wiltshire, England. The Bible was hand written in Belgium, by Gerard Brils, for reading aloud in a monastery. It is interesting to note the scribal abbrevations which are used thoroughly, such as the symbol for (-rum), (see the end of the first word on the second line) and the use of bars over vowels to indicate a missing n, "viginti annus" (second line again), and of course the symbol for "et" (although it is written in full near the end of the text). Other abbrevations include the modified 'p' for 'per' and the use of dots above characters to indicate missing letters (sup with dots, instead of supra). Autor Arpingstone on andnud selle teose avalikku omandisse. See kehtib üleilmselt. Arpingstone annab kõigile õiguse seda teost kasutada ükskõik mille jaoks, ilma ühegi tingimuseta, kui seadus neid just ei sea.